If you are migrating from the Project Backlog plugin, you may prefer to start with instructions in this article. FogBugz has long supported agile methodologies in its workflow. The Iteration Planner helps you to visualize your sprints in an easy, drag-and-drop format. Learn more about accessing and planning sprints using various features in the iteration planner by browsing through the following sections in this article. The Iteration Planner is available to FogBugz On Site accounts and FogBugz On Demand subscribers with the Agile Module. You can get to the Iteration Planner from the Planner menu; here, you’ll have the option to create or manage Planners. You can find out more about creating and managing Planners here. If you cannot access the Planner menu, contact us, and we can make sure your account has the correct features enabled! When you enter Iteration Planner, select the planner you’d like to use from the dropdown menu at the top-left of the screen, then choose the milestone(s) you’d like to use by clicking Add Milestone on the top right. This box allows you to search through both global and project-specific milestones, as well as to create new milestones for use in planning. 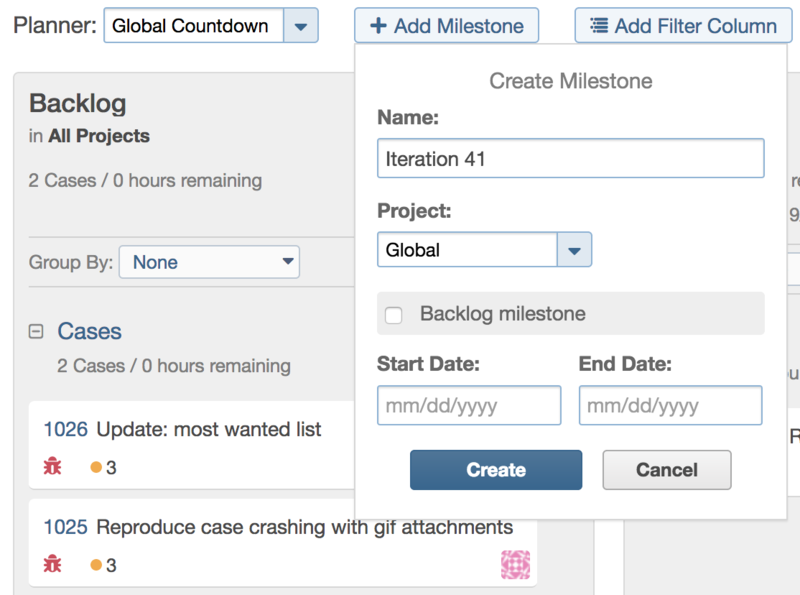 For example, you may want to use a Backlog milestone to triage your cases and add them to sprint milestones from there. When you’ve chosen milestones, you can then begin moving cases around. To add a case to your sprint, just drag it from your backlog to the sprint milestone, and drop it in the location you want — drag and drop cases to change their order in the planner as well. The Iteration Planner shows the case name, current estimate, priority, and assignee to help you determine the order of cases in the sprint. If you find you need more cases, they can be quickly created by clicking the plus button at the upper right of the milestone column and typing a case title. This will show a “Create new:” option you can click, or just hit Enter to confirm. This also functions as a full-text search on case titles which you can directly add, and filters which you can expand to add cases they find. 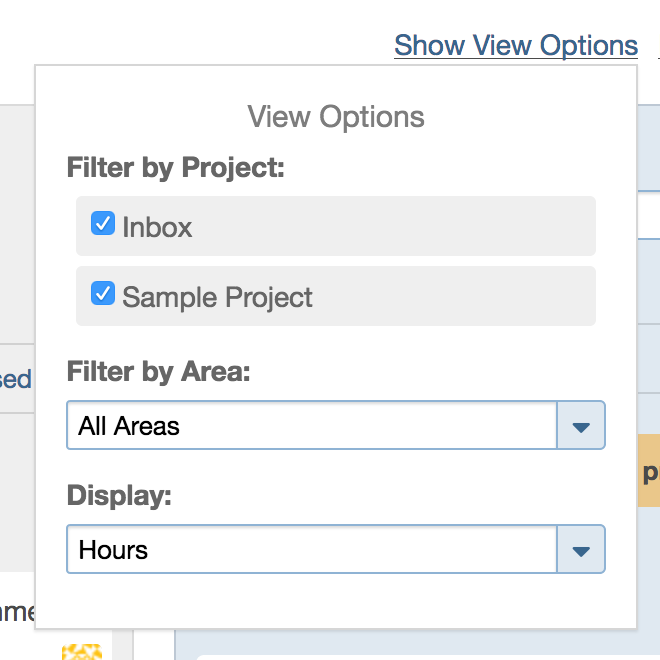 If you have cases from other milestones that you don’t want to see on your planner views, such as Undecided milestones, or cases you’d like to see that match a filter, you can Add a Filter Column. This lets you use any filter you have saved in FogBugz to add cases that match quickly. You may add as many filter columns as are helpful, and they can be reordered by dragging them around just like milestone columns. Filter Columns can be removed by clicking the x at the upper-right hand corner of the column. Filter columns are also convenient when you need to view a milestone in more than one planner. Typically, a project-specific milestone can only be added to a single planner. 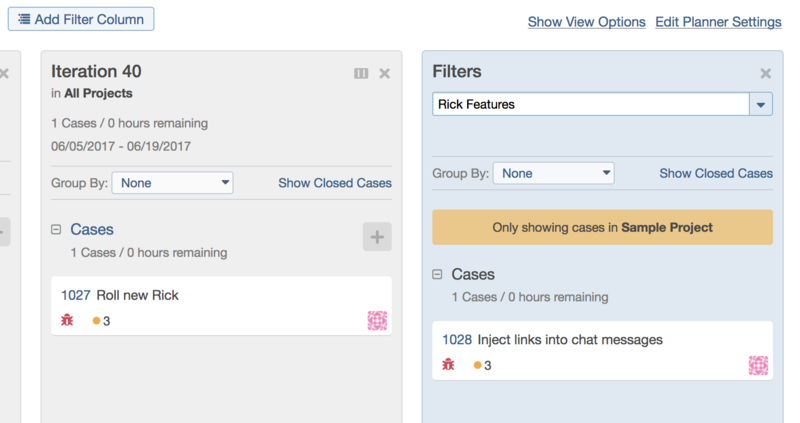 With the optional “Time Tracking & EBS” module, estimates can be added to cases within the Iteration Planner by clicking on the “Needs Estimate” on a case. A text box will appear, and you can type in your estimate and hit Enter to save. Estimates can be changed in the same way. Once an estimate is logged, a progress bar will appear. As hours are logged against the case, the progress bar will fill up. Need more detail? Hover the mouse over a progress bar to see the exact values. Within the sprint, you can further group cases by their Kanban column, priority, project, assignee, or status. Click the “Group By” section to see this. Within the grouping, you will also see a breakdown of the number of cases and the remaining estimated time in each group. Questions? Suggestions? Unadulterated praise? We’d like to hear it all! Please contact us with all your insights!